It's not very often most Mainers get a break from these gray dreary days that often last from late October to early April. Lucky for us, we were able to stave off our post-holiday blues a little longer with this lavishly beautiful winter wedding. Even luckier- we got to work for very dear friends of Meredith, who after about eight years together, decided to tie the knot in incredible style. In the beginning stages of planning, our bride -who has quite an eye for design herself- opted for a winter wedding in order to accommodate the attendance of as many family members as possible. 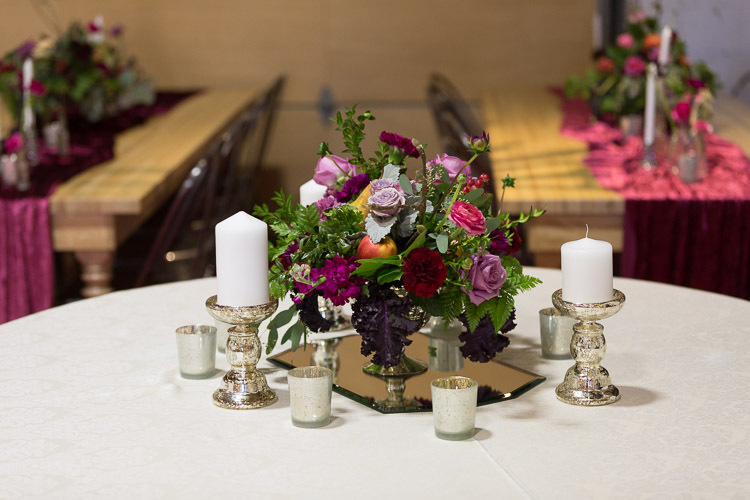 She envisioned deep burgundy and red florals in antique metallic vessels with crushed velvet table dressings, all for an old-world, almost Victorian feel. 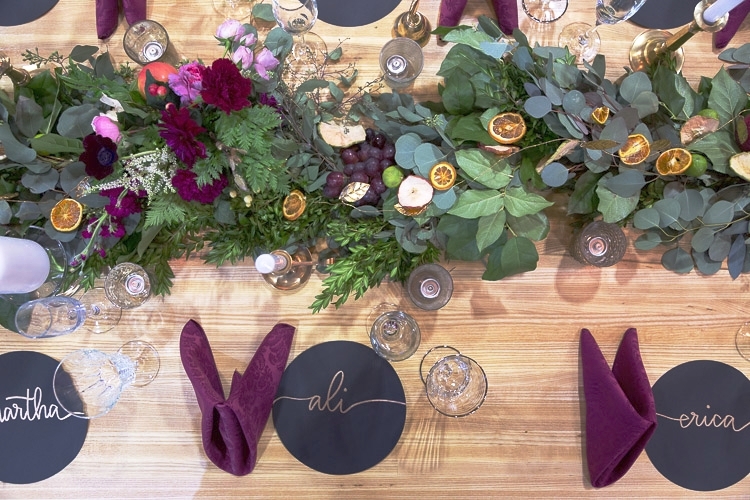 In the end we decided to add various jewel tones to give dimension to the arrangements and make everything pop, fresh seasonal fruits to accentuate the Victorian theme, and a large variety of greenery to bring as much life into the space as possible. In the end, with the help of Maine Event Lighting Pros, Bread and Butter catering, yours truly, and our hardworking and devoted couple with their loving friends and family, the warehouse space at O'Maine Studios seemed to transform into a completely different space, seemingly growing and overflowing with life and joy, which truly mirrored the love that they have for each other.